We are making great progress at the shopping department as many of the key pieces were picked up / arrived over the weekend. 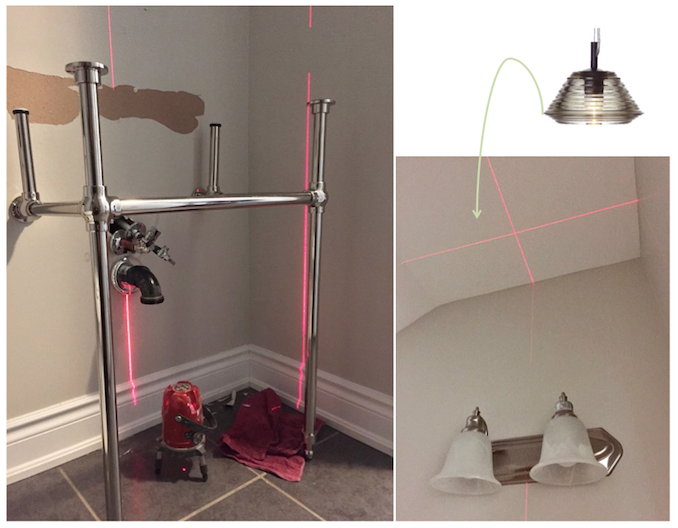 Before we can install our breathtaking Nuvolette wallpaper, the electrical work has to be mapped out and completed first. 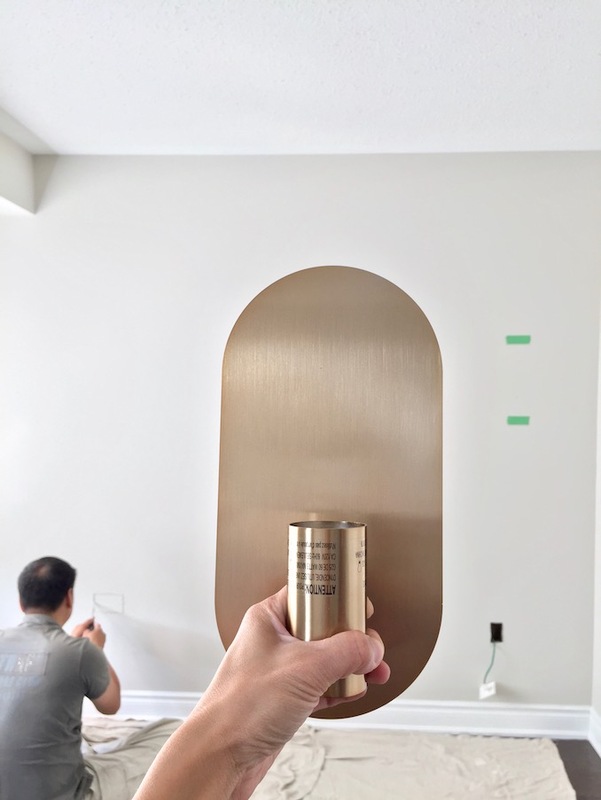 To ensure the wall sconces are placed at the right spot, a quick mock-up was done up to avoid confusion about the height and how far horizontally the sconces should be away from the adjacent walls. I highly recommend this method as it's far easier (and better result) than to google the standard height and placement of wall sconce in bedroom that may not work with your bed / bedside tables. 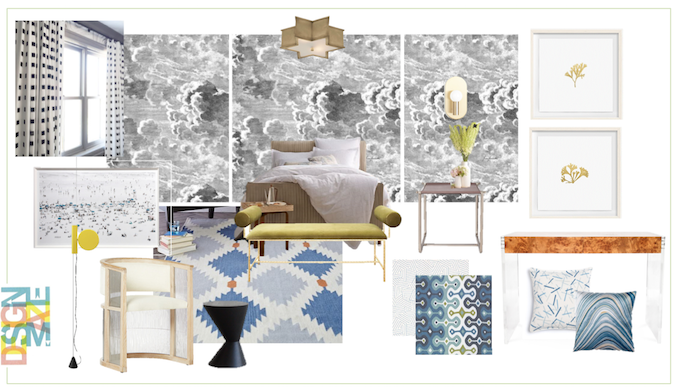 While we wait for the patchwork to get settled, we turned our attention to mapping out the wallpaper installation. 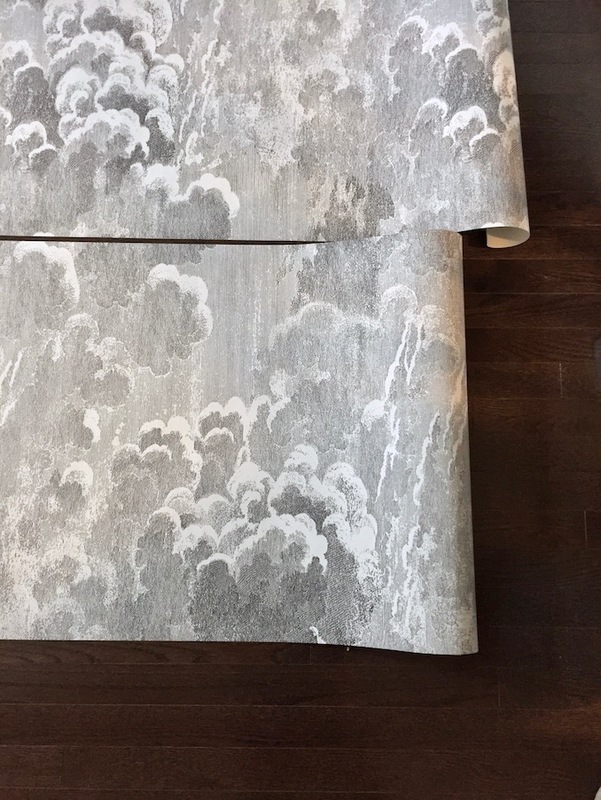 This is such an important step, especially when the cloud wallpaper comes with Roll A and Roll B for pattern match + this wallpaper represents a good portion of our makeover budget. If we screwed this up, we wouldn't have enough time to have the paper reordered, shipped, delivered, and reinstalled in the next three weeks. 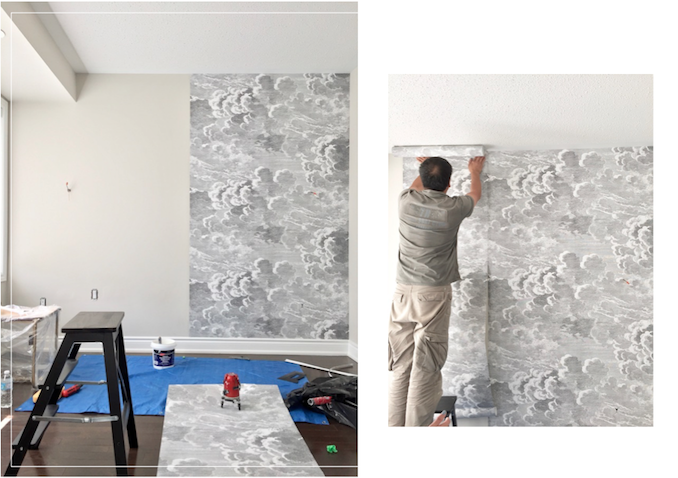 So we measured three times to ensure we have enough wallpaper for both rooms and to minimize the amount of wastage wherever possible. 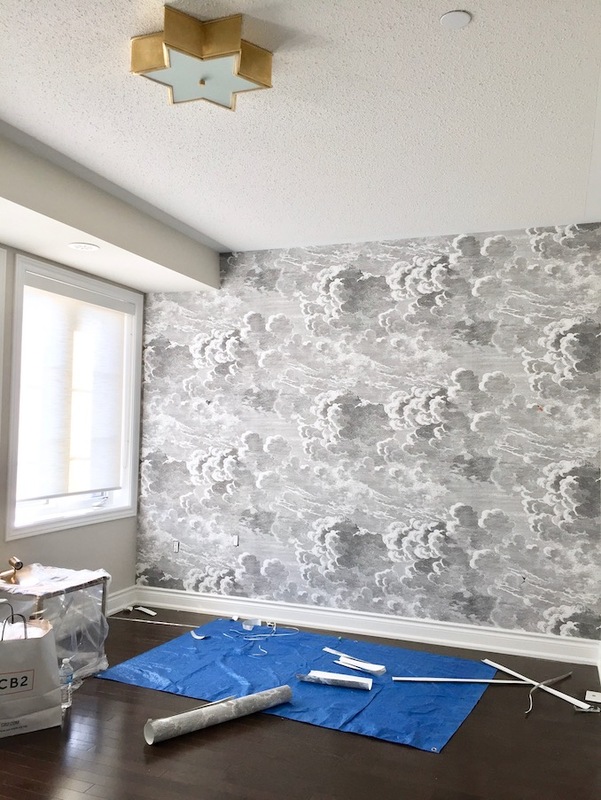 Our handyman is fantastic with many things but wallpapering is truly his specialty. He is so precise in his installation I honestly couldn't find the seams between the wallpaper panels! And the result? Let's just say I was totally blown away upon my return after a short trip to Lowes for some extra supplies. Now that wallpaper is up, the sconces could go up next week since we do want to give the wallpaper enough time to "rest" on the wall. Of course I couldn't resist pulling some of the key pieces into the space to try them out, and now I can go shopping for accessories and other finishing touches. 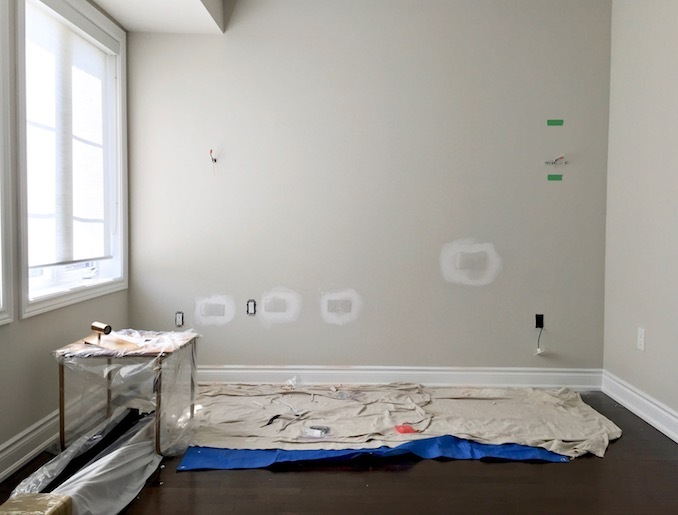 True to all renovation, it always looks a lot worse before things starting to look brighter. In my case, the old vanity, faucet, mirror, wall sconce all went to the local ReStore so someone who could use these gently used items in their homes. 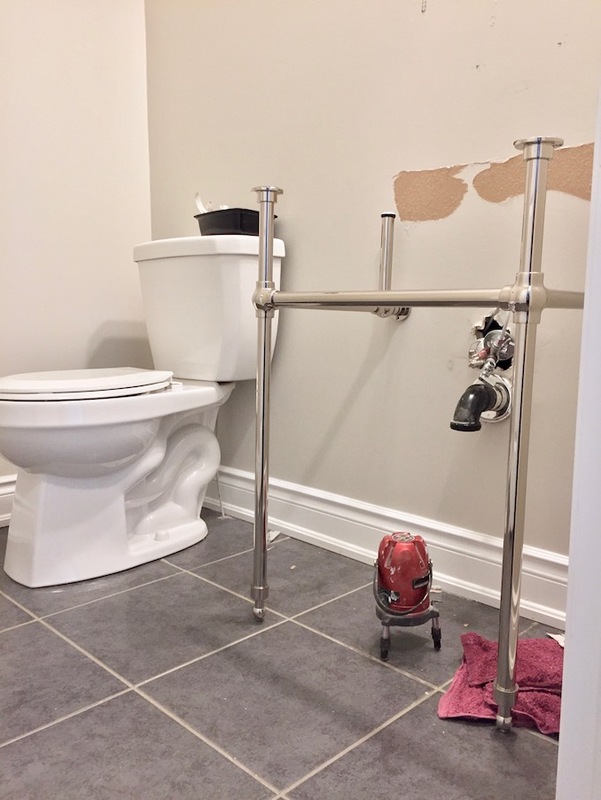 While the new vanity base is looking fabulous, the plumbing looks more like a horror story: hot water, cold water, water supply for the fridge on the other side of the wall all jammed up right here in the powder room. 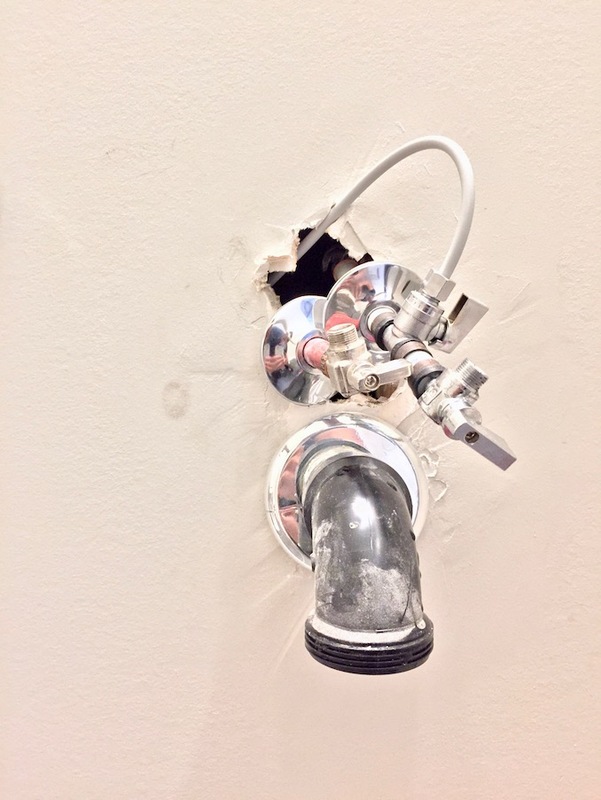 Our handyman will come up with a solution to "beautify" this plumbing situation. In the meantime, we nailed down the location of the overhead pendant. Man I love the laser action. 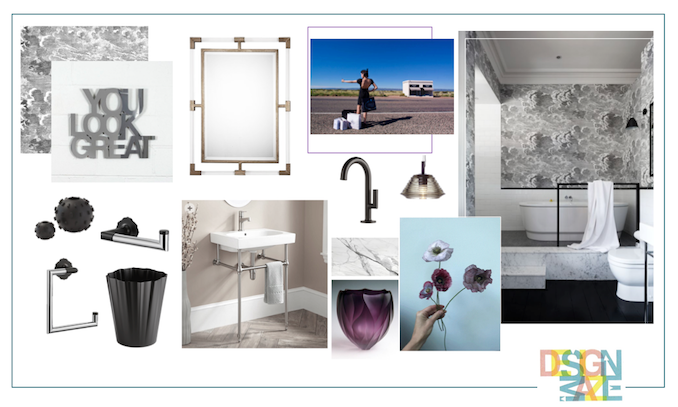 The pendant will be installed next week after the wallpaper is up and I can't wait to see the Jason Wu faucet makes its entrance into our dramatic powder room. 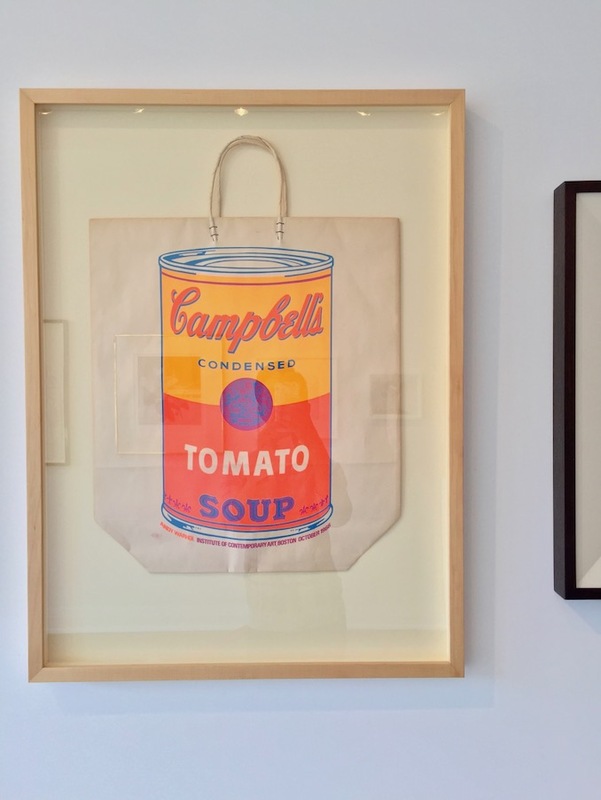 Before we wrapped up Week 3, I also managed to visit Caviar 20 pop-up store in Toronto to pick up the sophisticated and super fun wall art: You Look Great by Jade Rude. 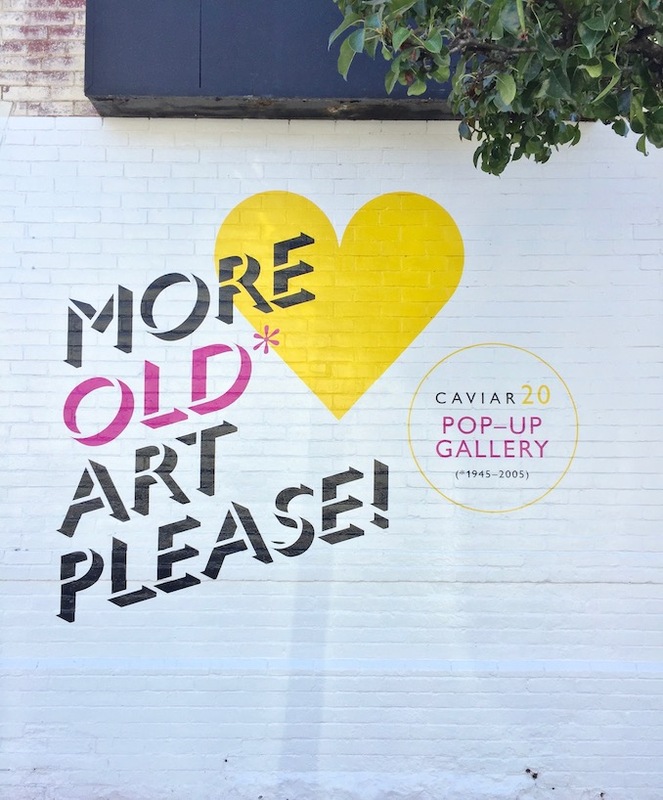 Caviar 20 pop-up shop is by Harbord Street and Brunswick Avenue (best to email for appointment time). 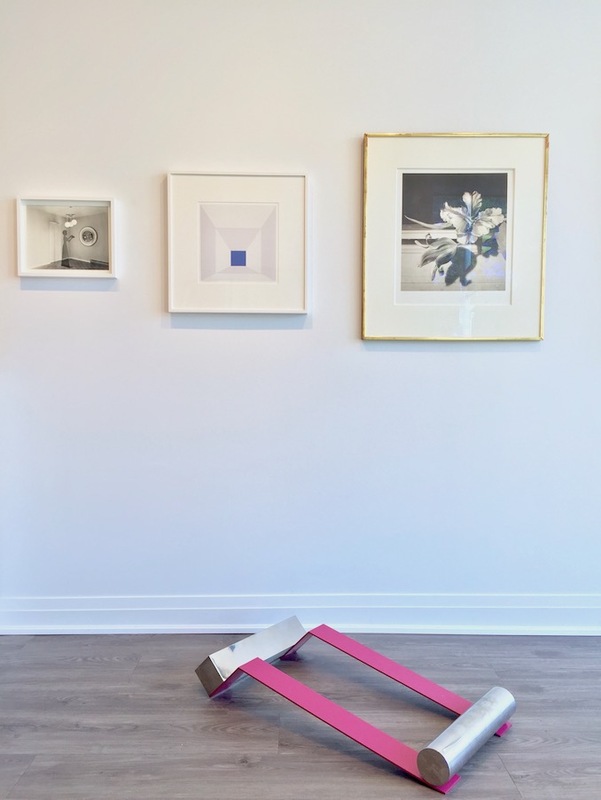 You can also check out some of Caviar 20 top pieces at Art Toronto 2017 from October 27-30. 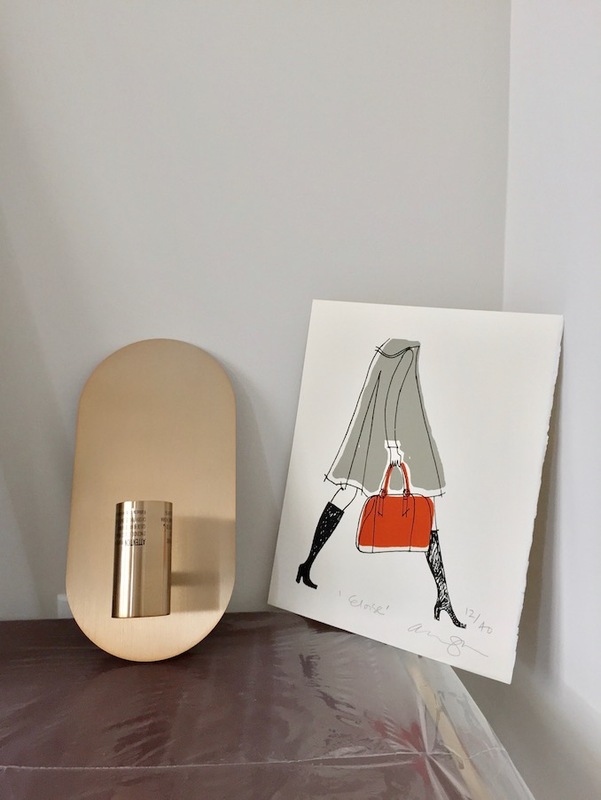 A lot will be happening in Week 4 in the powder room and I can't wait to see the custom desk installed in the guest bedroom. 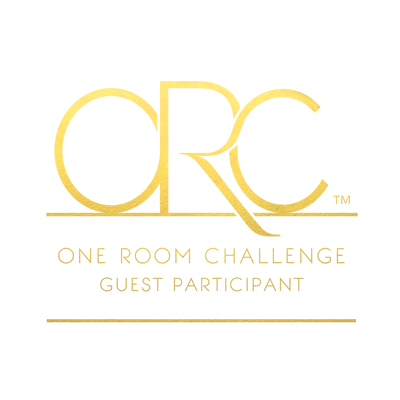 Be sure to check out Week 3 of the 20 featured designers and other guest participants on One Room Challenge! Wow, I love every last piece! It's so fun to see everything start to arrive. And THE WALLPAPER!! So stunning! thanks Laura!! fingers crossed it will be smooth sailing for the next 3 weeks! i'm loving everything about this, the wallpaper, the gold accents, old art!!! Can't wait to see it all come together. TYTY Maggie! only 3 weeks until it's all done! I've been removing wallpaper for weeks but if I had this in our house it would be staying!!! 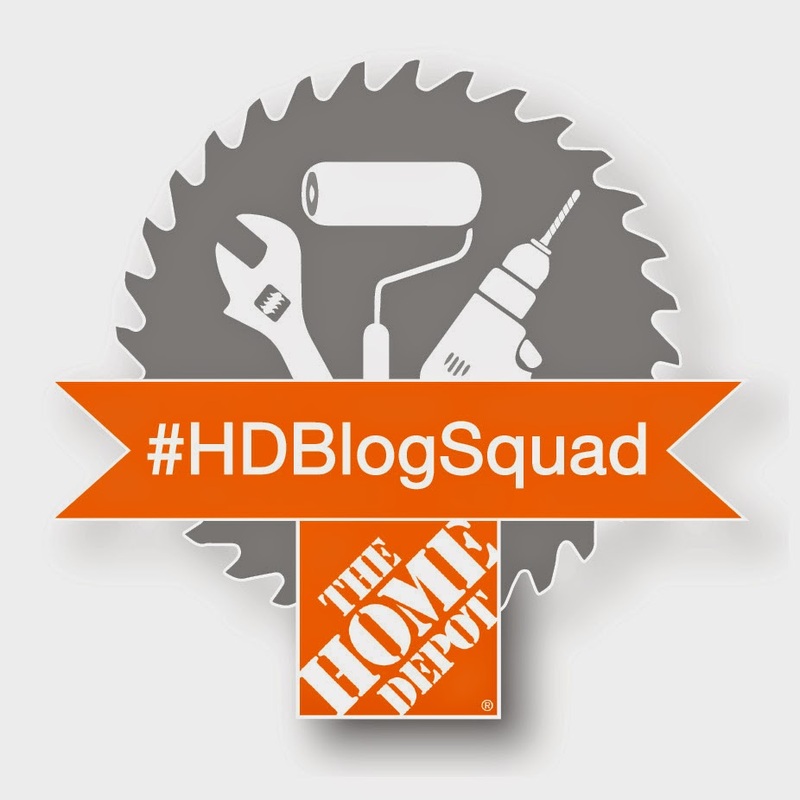 Good tips on the light fixtures and wall sconces, we find the "standard" basically never works for us because the whole family is so tall, the same would go for a shorter family I would think. 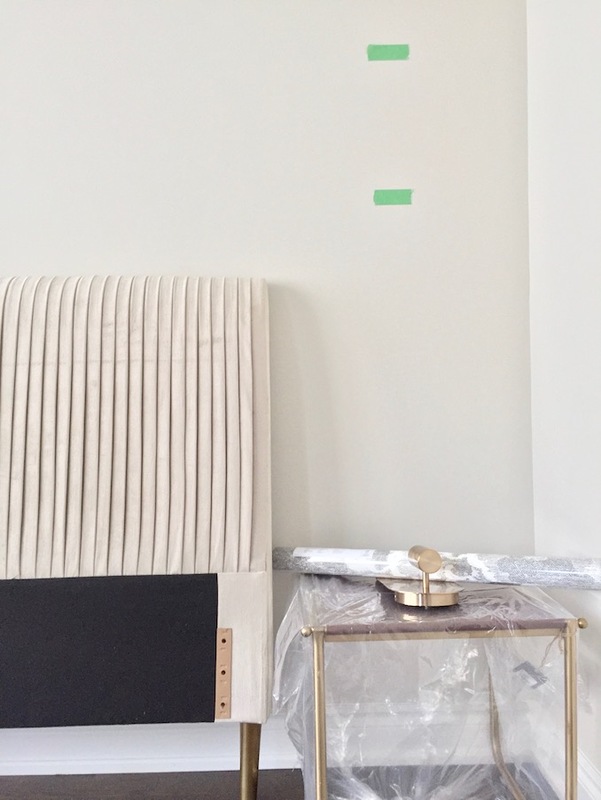 Can't wait to see this beautiful design come together! so true right Susan? "Standard" is really relative and all depending on personal preference too. Glad you find the tip helpful too! Looks amazing! 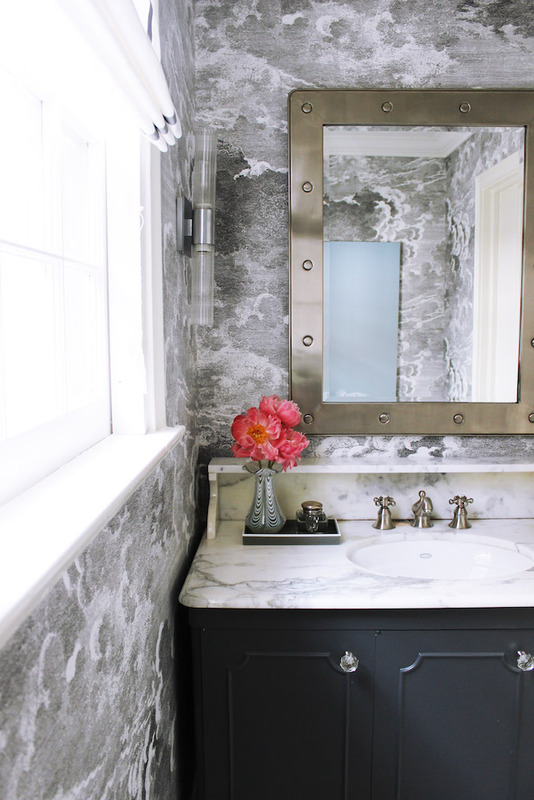 I wanted to use that wallpaper in our ORC powder room but opted to paint. Living vicariously through you! thanks Maggie! Use it in your room after! I LOVE that rug! Have been waiting to use it since I first saw it a few years back and so glad to have found the perfect spot for it! That paper is FANTASTIC!!! Can you tell me where the rug is from? Love it!! Thanks Dana!! 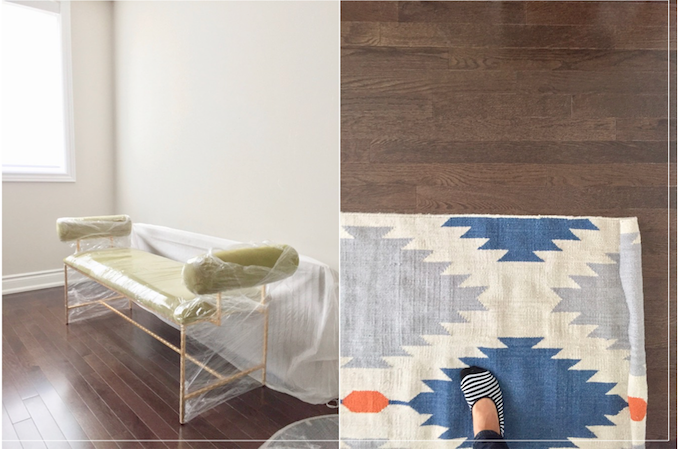 The rug is from WestElm! Tim - Thanks for stopping by to see my #oneroomchallenge kitchen remodel! Love that you donated to ReStore - we also donated our cabinetry to ReStore (it was a process, but we did it). 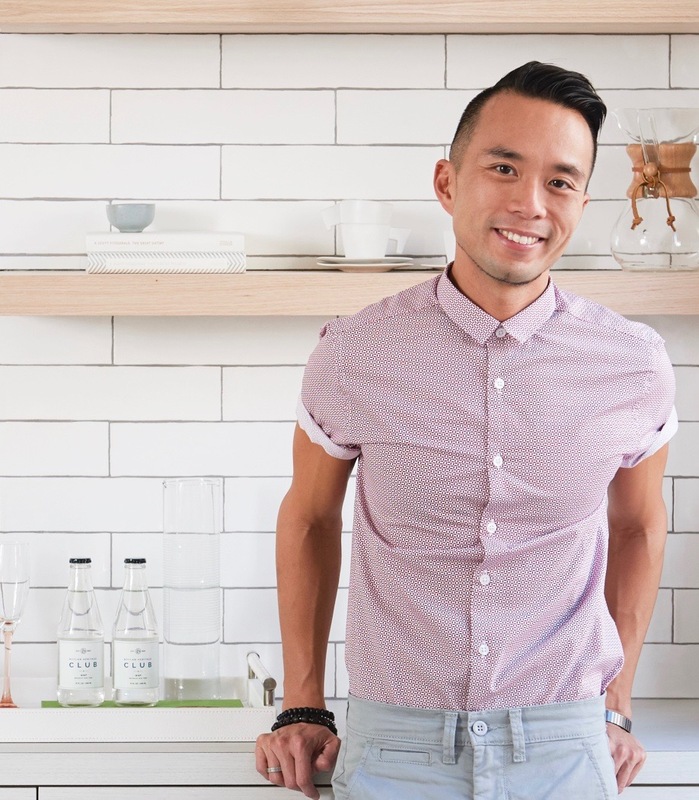 Excited to see your progress and really cool to see wallpaper making a come-back! isn't that great? items in good condition going to a happy home? Holy cow, that WALLPAPER. Beyond beautiful! And that bench! CANNOT wait to see it all together! Thanks and yes I LOVE it too! 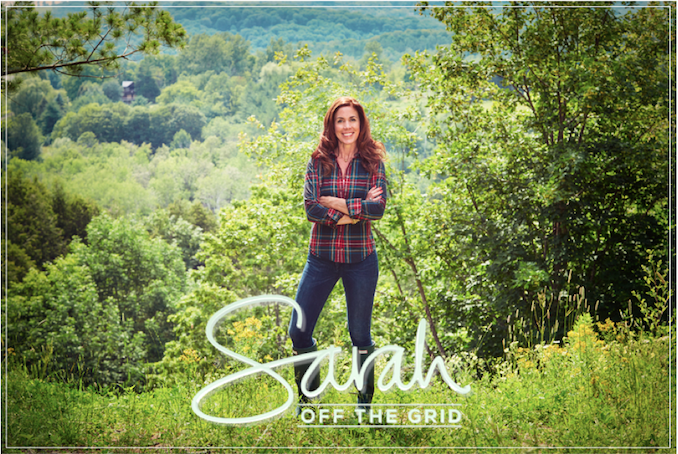 can't wait to share more next week! Tim, that wallpaper is stunning! I never thought I liked wallpaper until I moved into BHH. Now, give me ALL the wallpaper. 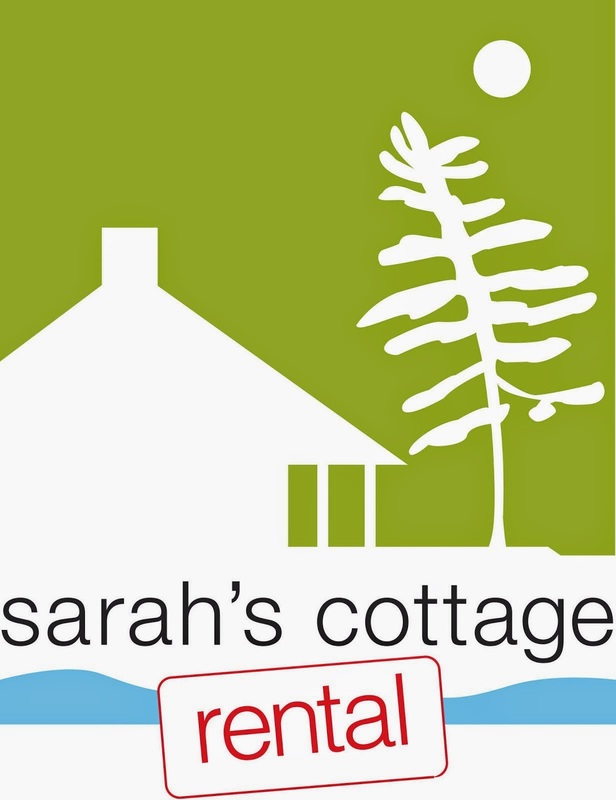 :) Your design is the real deal, and I love following your project. Oh I love wallpapers!! what are some of the ones you have used? That wallpaper is absolutely stunning!! And so smart to lay out the sconce positions on the wall. We have so many weirdly place wall sconces in our house; I wish we'd just taped it out first! Thanks Melissa and yes that's the number one tip I have for finding the right spot for sconces! 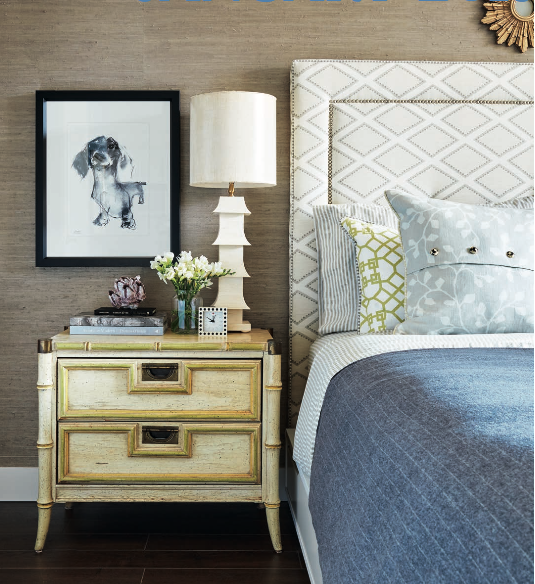 I'm totally swooning over that wallpaper - amazing! Thanks Kris! That's one amazing wallpaper! I am glad I get to use it in these rooms! Oh my word! I can see why you were totally blown away. It looks amazing! 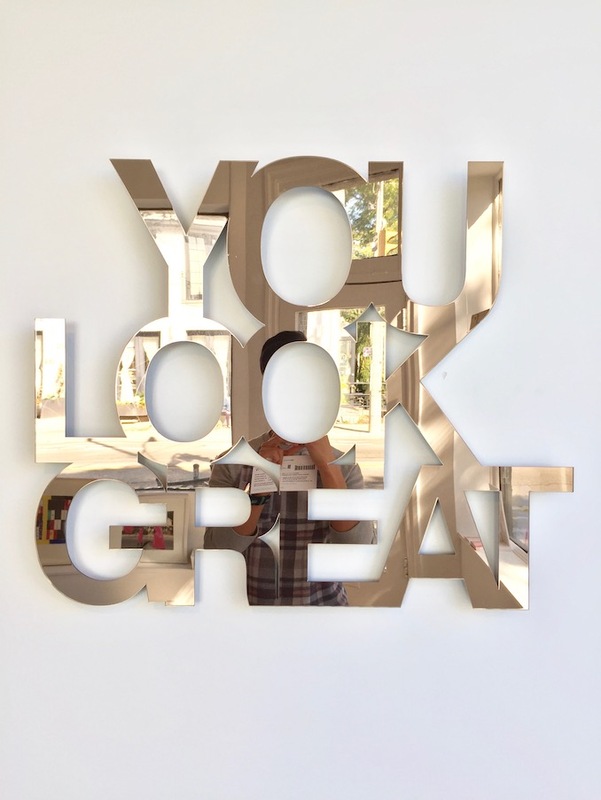 Your designs always look fabulous, so I cannot wait to see how you pull it all together. Good luck Tim. The wallpaper! And the bench! Love, love, love! Thanks V!! Yours is fabulous too! Thanks Barb!! You need to join us next round! This room is already looking stunning Tim! THAT WALLPAPER!!! And of course the bench, and lighting, and everything! So excited to see it all done! Thanks Vel!! Loving yours too! 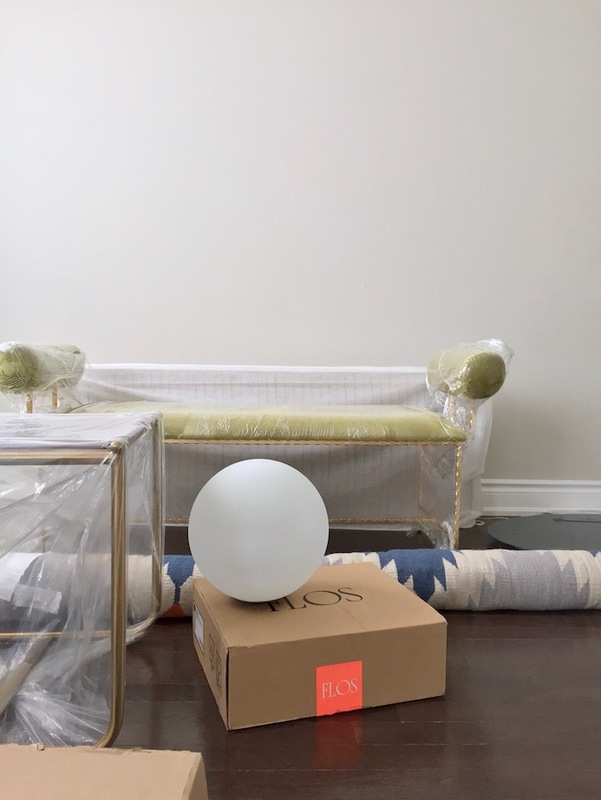 I love that time in a room makeover when the space is blank, but all the boxes start arriving. It's so full of possibilitis and dreams! And then reality sets in when you have to start installing everything, ha! I'll be back next week for another update!